Cyberpunk is all the rage these days, isn't it? A game that was first showcased at last year's Gamescom event, Hollowpoint, is shaping to be one awesome co-op game by Ruffian Games and Paradox Interactive. 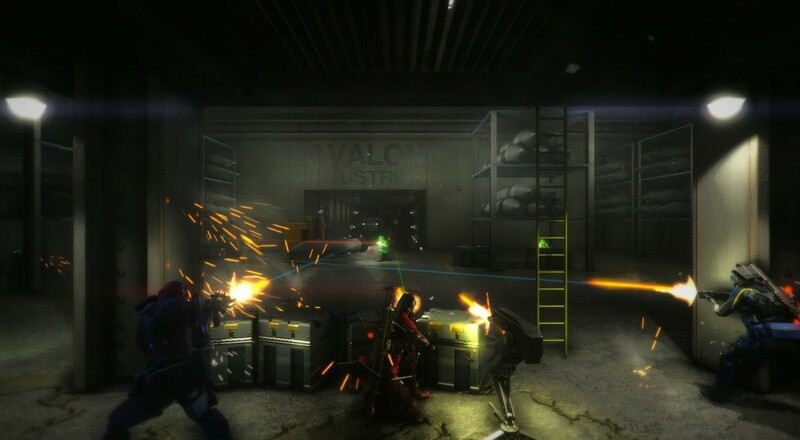 Hollowpoint is a platform shooter game we've had our eyes on for its four-player online co-op and the unique blending of both 2D and 3D elements in firefights. 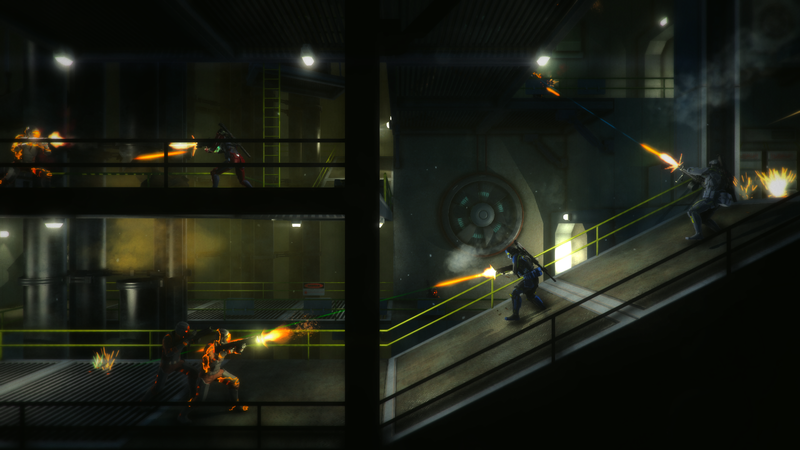 Mixing together high intensity combat action with some tactical elements, players must work as a tight, special operative unit to progress through a built stage with enemies constantly engaging almost every step of the way. What's interesting is that these stages are both 2D side-scrolling, but have 3D cross sections that present a distinct visual appeal to the player when dealing with multiple enemies on screen. Enemies might be firing from far off on a stairwell or down a lengthy corridor, or right next to your character. Choosing how to position your character plays a big part in how well your survivability will be in these situations, given the multiple levels of enemy placement. With the simple touch of a button, the game has an interesting mix of both old 2D platform shooters with 3D shooting gallery experiences. In our opinion, blending these mechanics alone are what makes the game stand out from most platform shooters in the market today. Players will also have the chance to customize and upgrade their characters through level up progression mechanics to freshen things up. Each mission, also called a 'Contract' allows for a wide varied of game experiences and tactical situations, with loads of Objectives that make up the contracts. Along with the dozens of weapons, abilities, powerups, and suit attachments available in Hollowpoint, this game will have a ton of flexibility for many players with a wide variety of play styles and preferences. Of course, playing alone is great, but playing cooperatively with other players is usually a much more enjoyable. With up to three other players online, the number of guns on your team helps to keep everyone's survivability up. 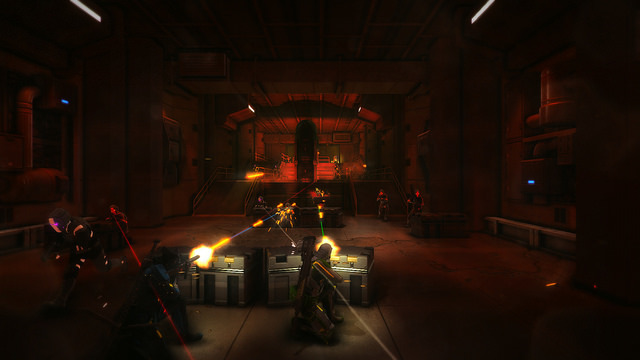 For instance, when players are incapacitated from gunfire, co-op partners are able to revive them and bring them back into the game; a tried and true co-op element. But that's not the only reason to bring in some teammates to help out: various Abilities have wide range of effects that can only be strengthened when buffing teammates who are within range. Also, rewards in XP or pickups like Ammo, Credits, or Health items are also given to teammates who are close to the player who took them out, so it pays to play close together as a team. Another aspect is the Credit Bonuses that apply when players clear objectives faster. In single player mode, rooms within stages can only be completed one at a time. In co-op, however, multiple players means multiple threats can be cleared in multiple rooms at once, great for getting Gold Level bonuses for extra in-game purchasing power. Since most enemies will be dividing their efforts to take on all players at once, there's more survivability as well. Hollowpoint will be arriving sometime later this year on both PS4 and PC. No release date set just yet, but stay patient! Page created in 1.6885 seconds.